Texas whitetail deer hunting…there’s nothing else like it! Only one state holds the title for the birth of modern whitetail hunting: Texas. 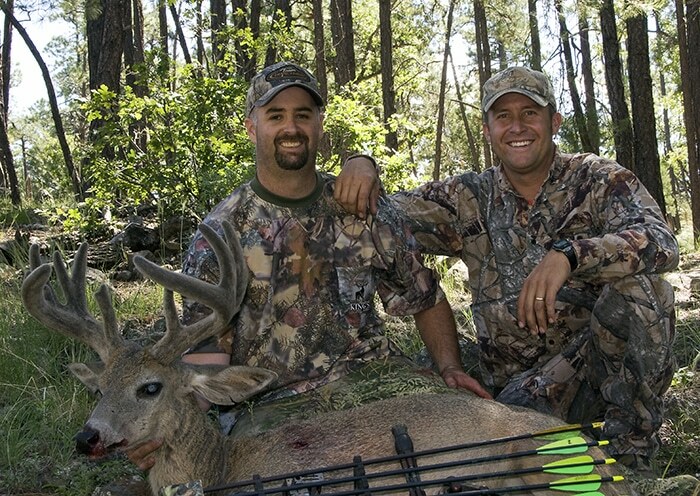 Texas whitetail deer hunting is synonymous with deer management. Whitetail management, food plot innovations, hunting products and calling strategy all can be traced to the Lone Star State. Have you had luck rattling in whitetails? Give some credit to innovative Texas hunters. Does your food plot attract a nightly herd of whitetails? Thank a Texan. It’s also the birthplace of quality deer management and a hunting destination you should enjoy at least once during your hunting career–there’s nothing like Texas whitetail deer hunting! I’ve had the good fortune to hunt South Texas on numerous occasions. The mesquite brush, ranching heritage and ghost-like whitetails make it a destination to remember. I also enjoy the balmy temperatures and have relished in the challenge of hunting deer that rarely give you a second look when you jump them. With memories like that, I couldn’t ignore an invite from Danny Pierce and guide Mark Scroggins at Rush Creek Guide Service to hunt Texas whitetails. More attractive was the fact that the hunt wasn’t going to be in South Texas, the site of my other hunts. Rush Creek Guide Service is located near Wheeler, Texas, in the eastern half of the Panhandle. I’d be hunting ground within a stone’s throw of Oklahoma and with an appearance similar to many of my Great Plains’ locations, yet strikingly distinctive with Texas character. Rush Creek Guide Service outfits for whitetails, mule deer, pronghorns, Rio Grande turkeys, bobwhite quail, doves and predators. Whitetail hunting is done from treestands, ground blinds, natural blinds; and on some of their properties, a spot-and-stalk hunt is the only game in town. Texas has a host of seasons and Pierce accommodates all hunters from archery season in October, rifle hunts in November and December, and muzzleloader hunts into January. With 30,000 acres of hunting property, Pierce and Scroggins promised me we’d have ample opportunities to move about, if the action was slow at any one location. Driving to Texas and to camp is easy. Major highways connect cities for an easy flow of traffic, but be prepared for traffic. Wheeler is experiencing a major boom in oil exploration and it is evident on the roadways. Highways are bustling with traffic, diners are jammed at mealtime and motels have high occupancy rates. It’s a boom most towns only hope to have to breathe life into a region. In addition to the energy boom, the area is prime cattle country; and surrounded by fields of cotton, wheat and other grain crops. Arriving late, I coordinated with my guide Scroggins and soon we were sneaking toward a ground blind in the predawn darkness. At sunrise, I could identify with the location Scroggins had chosen. It was an opening in the middle of a brushy patch that whitetails loved to pass through on their way from a nearby field to bed in the impenetrable refuge. Deer sightings were appreciated, but nothing moved toward our rattling and we didn’t see a mature buck. By midmorning, the sightings dropped to zero directing us to lunch, and a new plan. Over lunch, Scroggins explained that our early December hunt was definitely in the post-rut window. The panhandle’s northerly location meant it followed a November rutting timeframe like much of the country and not a December rut like South Texas. Since the area is still classified as semiarid post-rut, hunting can be productive. Tired and lean bucks gravitate toward green fields to boost their body weight before the characteristic ice and snowstorms set up a winter feeding pattern. Scroggins suggested we try the same area, but instead of focusing on the opening, he felt a field-edge setup was best. Just before sunset, deer started streaming from the brushy tunnels that led to the field. One by one does, fawns and young bucks swarmed the field, but no older bucks showed. Just before the end of shooting light, two nice bucks (likely 3 ½-year-olds) arrived, but it was too early in the hunt to consider downgrading. For the next several days, Scroggins moved us from spot to spot in hopes of tracking down bucks they’d seen during the rut or discovering deer on a new feeding pattern, which oftentimes appears overnight during the post-rut. With the hunt on the downhill side of the end, Scroggins decided to return to the green field with all the action we’d hunted the first evening. I hoped another buck had moved in or had simply gave up a nocturnal feeding cycle. Maybe letting the field sit idle for a few days would result in a boost in buck confidence. We headed to a brushy, downwind corner and set up for the afternoon. As the sun started to set, the typical dining crowd showed up. Does and fawns, together with a group of adolescent bucks, fed and chased each other around in teenage fashion. To ensure I was ready, I ranged all corners of the field with my Nikon Riflehunter rangefinder. My confidence was high. All the shots were less than 250 yards and easily manageable for my TC Venture in .300 Winchester Magnum. Adding to my positive poise was my earlier successes with one-shot-kills using Hornady’s Superformance ammunition with the 180-grain SST bullet. I’d been there before. Snap decisions and snapshots are a part of deer hunting and even though I knew I was ready, I ran through my mental checklist again. Looking up, I saw the buck lunge at a doe and he stopped in the open. We both gave the buck a good look over with our binoculars and agreed; he was a shooter. Just as I lifted the gun to shoot, the buck dodged back behind the vegetative screen. He certainly had a spark of rut left in him and I tracked him in the riflescope, ready if he darted out into the open again. “It’s getting so dark I can barely see him,” Scroggins whispered again. I agreed, as I tried to keep track of the cagey buck. Glancing down at my watch, I noticed I still had a few minutes of legal shooting light left. Just then, the buck darted back out into the field, giving me a straight-on shot. It wasn’t my preferred angle, but I knew my rifle setup could pull it off. I squeezed the trigger. “He’s down,” Scroggins called out! In an instant, we were off to find the buck. The shot was approximately 200 yards and the buck appeared to drop in a section of tall grass bordering the cut hayfield. We both reached the location at the same time and fanned out. He had to be right there, but he wasn’t. To make a long story short it took us another 30 minutes to find the stone-cold buck. Intermittent mowing while haying created large swaths of uncut grass and he had fallen in one of these swaths. The low light and dense cover threw us off, but the excitement was still the same despite the take-a-number and wait search to find the buck. The buck’s wide spread, bulky body and worn teeth meant he was likely a 5 ½-year-old buck. The surprise ending was exciting and hunting a new part of the country with some hide-and-seek encounters made the adventure as big as Texas. Texas whitetail deer hunting…give it a shot!